Every March, the Cactus League, a tradition in and around Phoenix since 1947, stages the annual Arizona-based Spring Training pre-season for Major League Baseball. Today, 15 teams compete in the Cactus League, drawing a devoted following of fans. 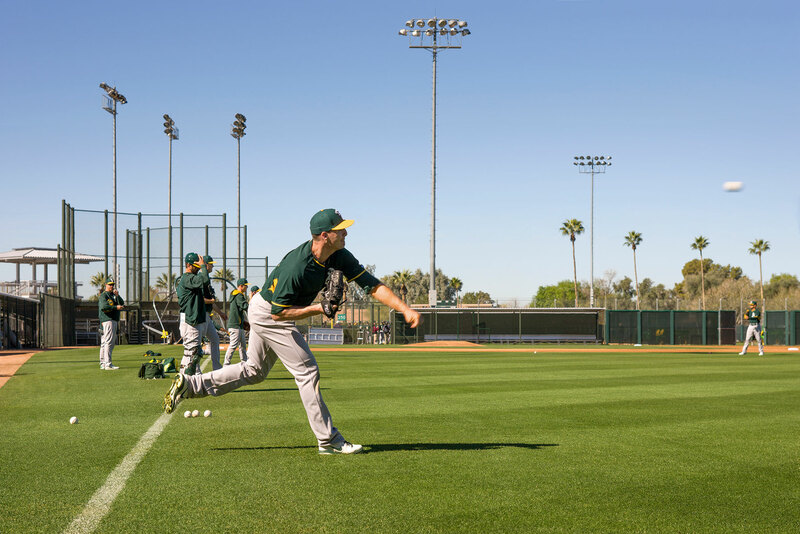 For the 2015 season, the Oakland Athletics and the City of Mesa worked with Gensler to renovate Hohokam Stadium and Fitch Park as the Athletics’ Spring Training venues and year-round Arizona headquarters. The upgraded stadium features greatly improved seating and a new high-definition video scoreboard, 56 feet long and 26 feet high—the largest in the Cactus League. The renovation also added some 26,000 square feet to the Athletics’ Lew Wolff Training Complex, including an expanded strength/training room, a hydrotherapy room with an underwater treadmill, and locker rooms that can comfortably serve up to 250 players and coaches. Hohokam Stadium is also home to the Men’s Senior Baseball World Series and several other tournaments. “In March, Mesa is the center of the baseball universe,” Mayor John Giles says. “Hohokam Stadium and the Lew Wolff Training Complex at Fitch Park are where the dream starts for the young players who come into our organization,” adds Athletics president Michael Crowley.